Learning to play an instrument is very rewarding. However, most of the time is spent practicing by yourself. Have you ever wondered what it would be like to play in a band? Here’s your chance… Join the Band! For over twenty years Join the Band has been placing kids, teens & adults in our band classes. It’s more than just learning songs. You experience what it’s like to be in a real performing band. Learn songs from popular and classic artists, as well as from a variety for music styles. You also rehearse in a professional music studio with like minded musicians to prepare for your concert. Everything you need is at the studio. Therefore you do not have to haul amplifiers, drum sets, keyboards, etc.. to your rehearsal. Just show up and play. Your teachers (Band Leaders) are experienced professional musicians that love to teach. This means you get the best possible band experience to guide you along the way. After practicing with your band you get to show off at a real concert. Join the Band concerts are held at popular Los Angeles clubs in front of a packed house of family and friends. We know you want to play. So what are you waiting for? It’s time to Join the Band! 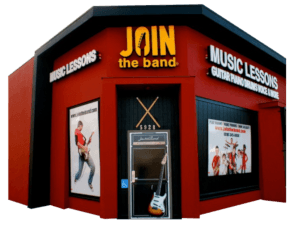 Join the Band’s ® staff of experienced professionals offer private, in-studio and home music lessons for guitar, bass, drums, voice, piano, brass, woodwind and stringed instruments through our trusted network of private music instructors in the Los Angeles area. Private music lessons provide students the fastest road to improvement and a more rewarding, enjoyable experience with their instruments. Our professional staff of music teachers are qualified to teach beginners through advanced level students in all styles of music.